Is it Easy to Obtain a Mortgage? For many households, obtaining a mortgage is the most important step when seeking to purchase a home. As housing analysts, a natural question to ask when assessing the prospects for home buying is “how easy is it for households to obtain a mortgage?” The Federal National Mortgage Association (FNMA) or Fannie Mae attempts to shed light on this question with two surveys. Through its National Housing Survey, Fannie Mae asks the general population for their view on the ease of obtaining a mortgage. Meanwhile, their newly created Mortgage Lender Sentiment Survey poses a similar question to mortgage lenders. According to Fannie Mae’s National Housing Survey, a monthly poll of a nationally representative sample of 1,000 respondents meant to convey the views of the general population, 48% of respondents thought that it was easy for consumers to get a home mortgage today. Another 47% thought that obtaining a mortgage was “difficult”. The rest answered “don’t know”. 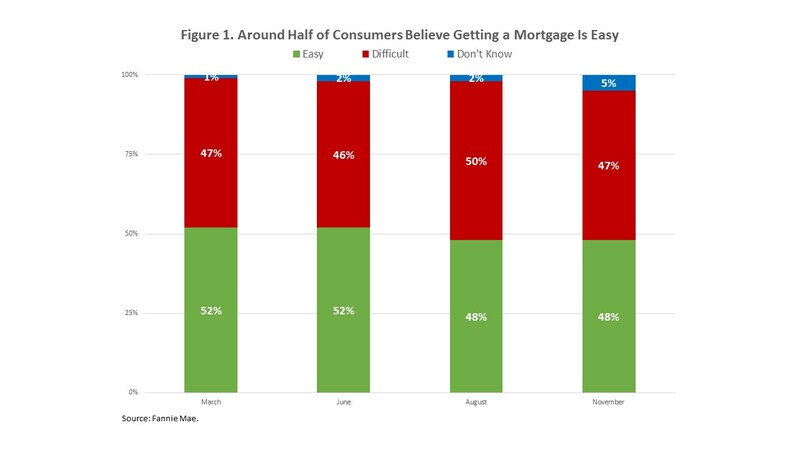 Figure 1 below shows that, while the proportion of respondents that believed obtaining a mortgage was “easy” fell below half after the June release, it has remained stable at near 50% over the past four quarters. 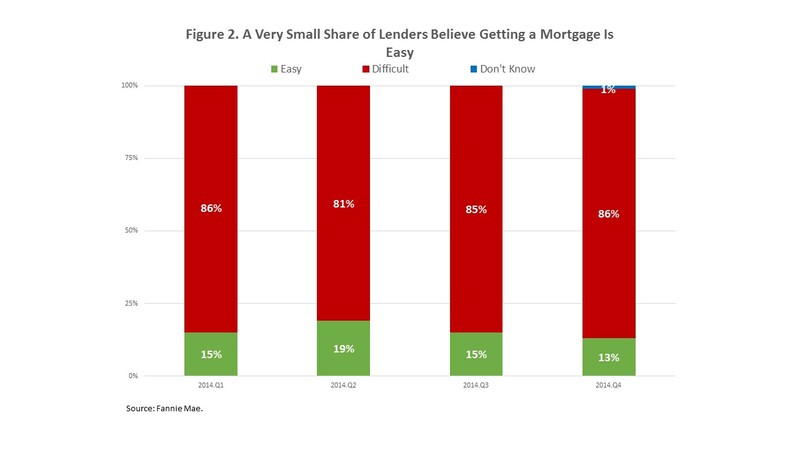 In contrast, results from Fannie Mae’s Mortgage Lender Sentiment Survey, which polls senior executives at Fannie Mae’s lending institution customers and was created to track lenders’ expectations for the mortgage industry, indicate that a very small share of lenders believe getting a home mortgage is “easy”. According to Figure 2, 13% of respondents thought that obtaining a home mortgage was “easy” while 86% thought that obtaining a home mortgage was “difficult”. The small share of mortgage executives that think obtaining a mortgage is “easy” and the large portion that think obtaining a mortgage is “difficult” has remained consistent over the past 4 quarters, the entirety of the series. One reason for the dichotomy in consumers’ and mortgage bankers’ views of the ease of obtaining a home mortgage may reflect their different perceptions of the mortgage denial rate. The observed or “traditional” denial rate is calculated by dividing the number of denied mortgages by the total number of mortgage applications. According to research by the Urban Institute, this “traditional” denial rate declined following the housing boom and is currently at 14%. However, the “real” denial rate, a measure calculated by researchers at the Urban Institute that adjusts the “traditional” denial rate for changes in the mix of mortgage applicants and the denial decisions of mortgage lenders, has been rising since the end of the housing boom. It now stands at 43%, more than 3 times the “traditional” denial rate. While consumers may be encouraged by the “traditional” denial rate, which takes into account mortgage approvals for those with near perfect credit, mortgage bankers may be focused on the pool of applicants with less than near-perfect credit. The real issue for the entire industry is not the perception as to how easy or hard it is to get a mortgage but what exactly is keeping 25% of first-time buyers out of the market. Is it the acquisition cost (down payment and closing costs) or is it the misperception that a buyer must have a large down payment. I personally believe it is largely some of both reasons. Until this is known and efforts to address problems started, I don’t see anything getting a lot better, at least not until the first-time buyers return to normal participation levels.